Meeting on the Telecoms Package, EP Strasbourg. 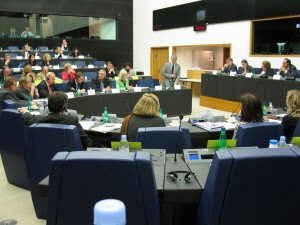 My MEP, Christian Engström of the Swedish Pirate Party, is one of the members of The European Parliaments delegation to the Conciliation Committé on the EU:s Telecoms Package. This means that I am in the meetings on this dosier. I can tell you that it is an interesting and somewhat disturbing experience. I also recomend you to read Monica Hoortens blog. She has a scientists way of looking at this process. Read her blog posts and her paper "The Telecoms Package - a licence to chill".